Bionic Briana: Stanley Park & such. 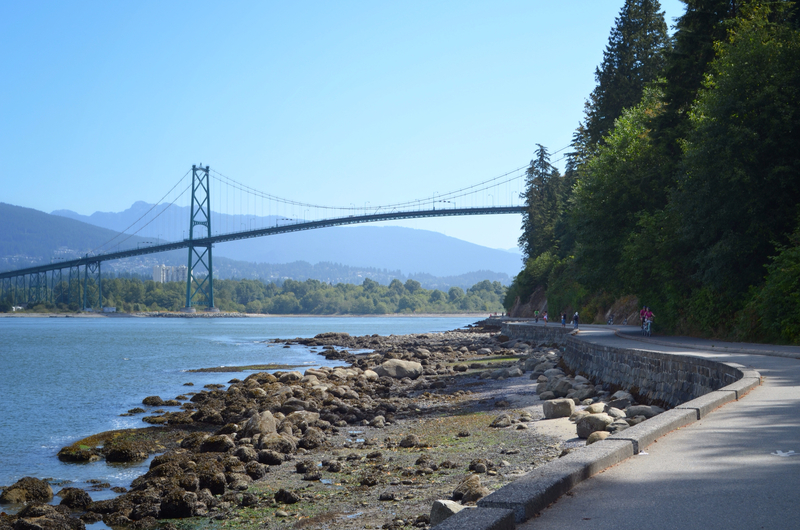 Stanley Park! Wild blackberries & Siwash Rock. 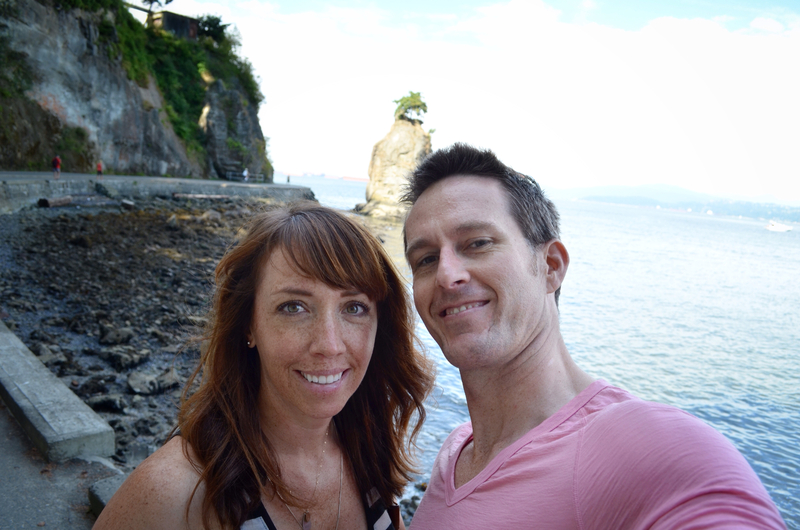 After a night out at The Flying Pig in Gastown for dinner, we slept in until the leisurely hour of 7:30 this morning and woke up ready to see the sights of Vancouver. Lee planned our trip here so I was completely unprepared as to what this city has to offer in the way of sight-seeing. 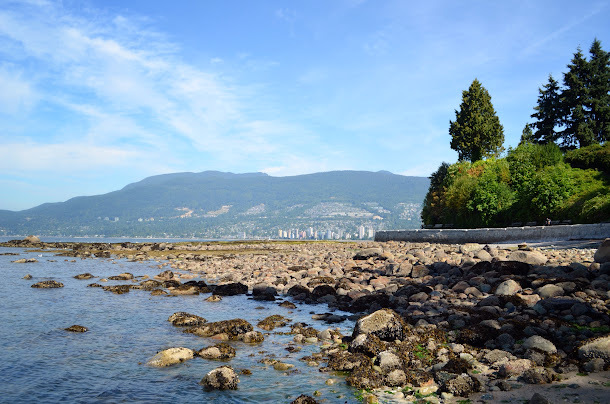 After grabbing coffee and pastries from Tartine Bread & Pies, we walked along Sunset Beach, admiring the English Bay as we made our way along the sea wall toward Stanley Park. Stanley Park is unbelievable! 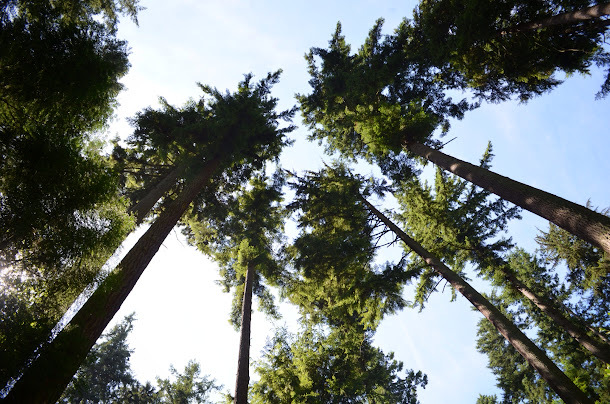 This 1,000-acre forested oasis juts out from the city and is surrounded almost entirely by the Pacific Ocean. 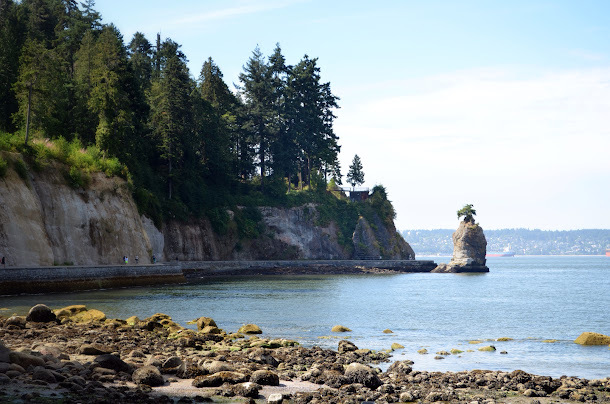 Walking along the sea wall is a photographer's dream! The views of the mountains, the water and the city are breathtaking. I must've stopped every few feet to snap dozens of photos (sorry, Lee). 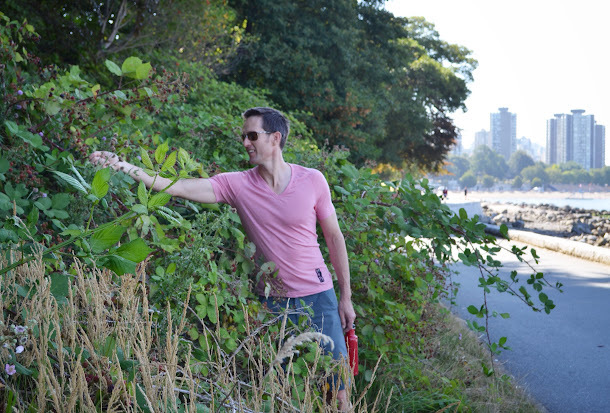 As we walked, Lee noticed that the mountain-side of the sea wall path was covered in wild blackberry bushes. And after having few and walking a bit more, we realized these bushes were everywhere! Of course the ripest berries within reach had already been picked but luckily Lee is tall and I am stubborn and neither of us were deterred from picking by a few pricks from thorns. 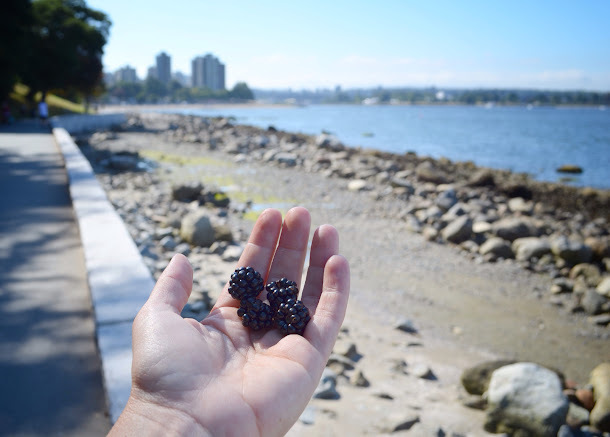 I imagine at the peak of their ripeness, the sea wall path is full of brave berry pickers. After getting our fill of blackberries, we continued on our walk along the sea wall to the sight we had set out to see. The Siwash Rock! 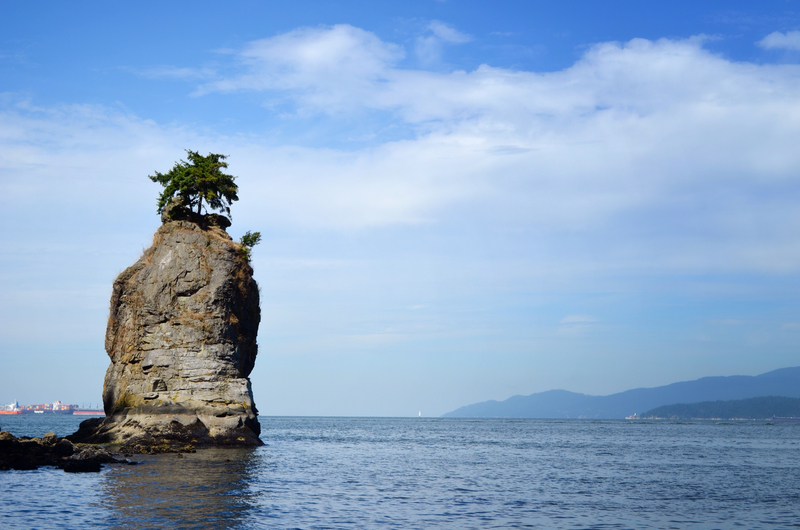 This almost free-standing rock with a tree growing out of the top is a must-see if you ever find yourself in Vancouver. Heading into the heart of the park. 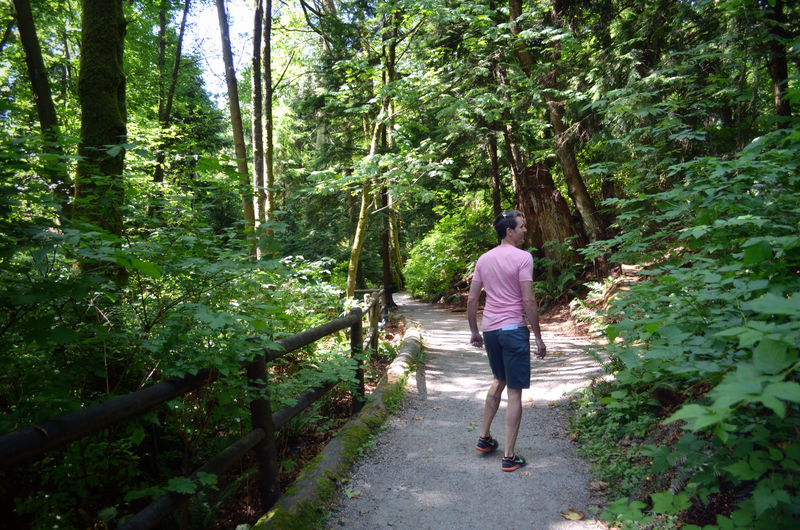 After walking most of the sea wall path, we headed on a trail into the heart of Stanley Park. We saw the soon-to-be extinct Beaver Lake, the Rose Gardens, and the float planes landing in Coal Harbour. Not surprisingly, it was all beautiful. With tired feet and grumbling bellies, we found our way out of Stanley Park, through downtown and back to Gastown for some lunch at the popular Meat & Bread sandwich shop. It was the height of the lunch rush and, OF COURSE, the line was out the door. 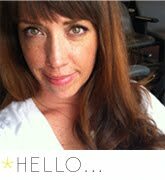 Short on patience, Lee wanted to bail and we almost did! But then the nice man at the door told us the wait was only about 10 minutes. 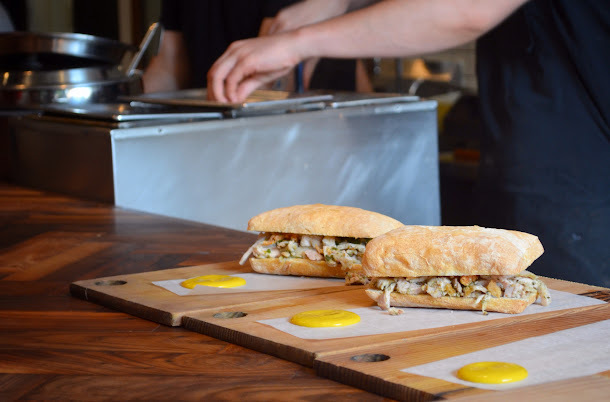 And then he told us about their sandwiches, one of which included a porchetta sandwich topped with crispy pork skin. Say no more, nice man at the door! You had us at crispy pork skin. Meat & Bread. 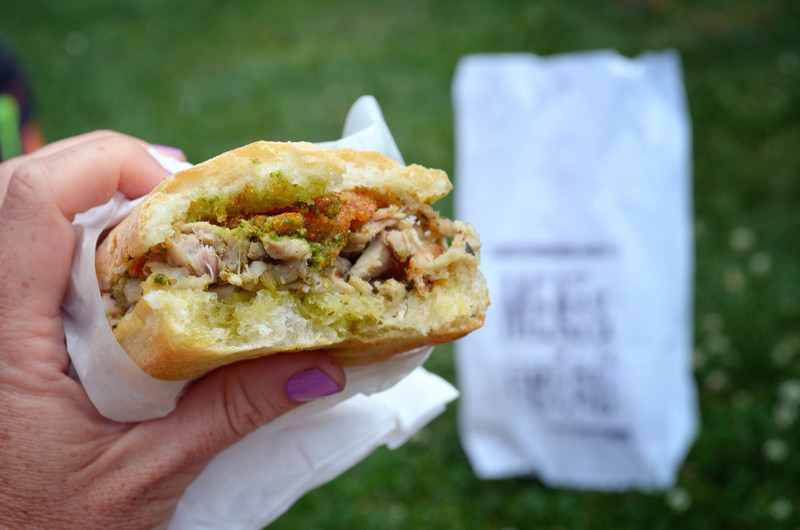 And the out-of-this-world porchetta sandwich. 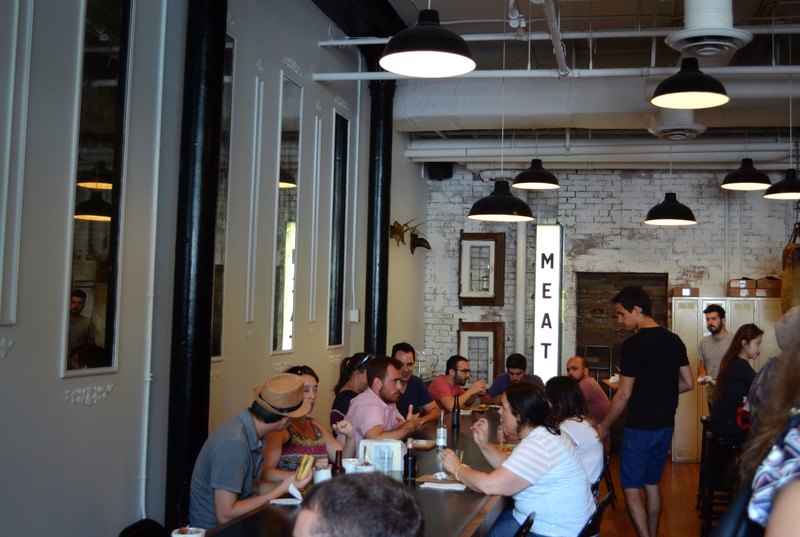 I love the name Meat & Bread for a restaurant - simple & to the point!! Vancouver looks beautiful & it looks like you're having a great time!